Amanda and her family moved to Hixson from Jasper, TN in 2015. After graduating from Chattanooga State in 2009, Amanda worked as a dental assistant in Jasper for 5 years. She joined the Premier Family Dental team in April of 2015. She has two small children, Jayden and Madi. While she's not at the office, Amanda enjoys taking her kids to the park, swimming, and spending time with her family. Brittney and her husband moved to Chattanooga from Shenandoa Valley, Virginia in 2012. Since then Brittney recieved her Dental Hygiene degree from Chattanooga State in May 2015 and has been working as a hygienist with the Premier Family Dental team since November 2015. Brittney strives to make each dental visit a positive experience for every patient. While not at work, Brittney enjoys spending time with her husband and their dog Zoey, camping, hiking and visiting with friends. Jami graduated from the Chattanooga State Dental Assisting program in May 2016. She joined our team in July of 2016 and will be assisting with all aspects of the practice from patient care to answering phones and scheduling appointments. She is originally from Chattanooga and graduated from Red Bank High School in 2009. In her spare time, she enjoys attending car shows, riding bikes and spending time with her friends and family. Samantha Peeples joined the Premier Dental team on November 13, 2017. Sam, originally from Florida, has been in the dental business since 2014. She, her husband and her 2 teenage daughters moved to the area in 2016.Sam loves interacting with patients and will be happy to answer any questions you may have about insurance and scheduling appointments.In her spare time, Sam enjoys jet skiing, spending time on her boat, enjoying the mountain views and spending time with her husband, Ryan, and two daughters, Summer and Kaytlin. Natalie is originally from Kingsport, TN. She graduated from the University of Tennessee, Knoxville in 2015 with a degree in Psychology and then went on to complete her Dental Hygiene degree at Chattanooga State in 2018. 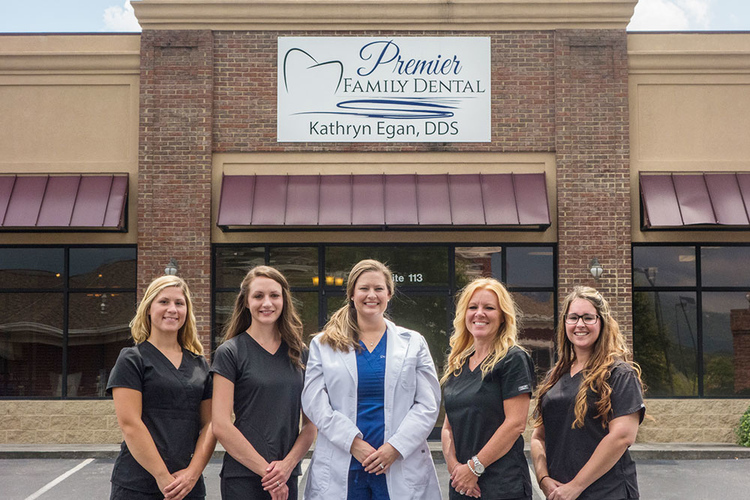 She joined the Premier Family Dental team in June 2018. She loves helping to improve the health of every patient she sees and is passionate about educating them so they can reach their optimal health. When she isn’t working she enjoys playing volleyball, hiking, spending time with her cat (Poe) and traveling.